This version of the Y-wing made its first appearance in the Star Wars: the Clone Wars animated series. It represents an earlier and heavier version of the vehicle seen in the movies. It is known officially as the BTL-B Y-Wing. The overall quality of the casting is very good for this kit. There is very little flash to clean up, but there are a couple pour spots that need a little work. Parts fit is good and quite intuitive for the most part. The kit does have a couple of downsides. 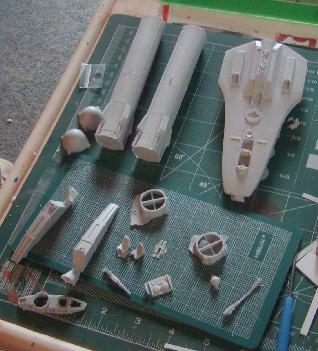 First, the kit has a lack of alignment tabs, and the engines need to be “eye-balled” for placement. Also, a turret bubble is not supplied, so you will need to supply your own. Finally, the kit does not include any instructions. Depending on where the engines are mounted, the finished model comes out between 8.5 and 9 inches in length. 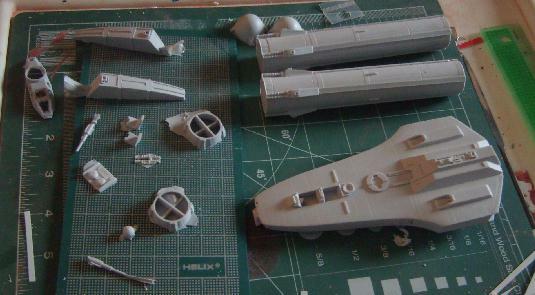 This scales-out to slightly less than the stated 1:72 scale but the model still looks good and fits in well with other ships in this scale, such as the Fine Molds kits. Due to the lack of instructions and alignment tabs, this kit would not be an appropriate “first resin kit” for a modeler, but it would not present any difficulties to an experienced modeler.